The first time I interviewed Andrena was in the main lobby of a large urban hospital. A cavernous space. Strangely dark, even formidable. Later I could see that the gloom had its comforts. A good place for quiet crying, or for staring into nothing. High ceilings, clusters of permanently fixed plastic chairs lined up in rows of three or four, or set together in L shapes. Chairs as neutral as could be, in tones of beige and practical brown, placed neatly on the wall-to-wall gray carpet. Some leafy potted plants (plastic too, but the realistic kind) helped divide the room into smaller waiting areas. The lobby always felt empty, odd for a hospital full of children. At one end, almost unnoticeable, was the receptionist's desk-not the busy center of this clinical space, as one might expect, but far away, giving the impression of a waiting room with nothing to wait for. Of course, I could have some of these details wrong. This interview took place many years ago, the fall of 1997, and the hospital was redecorated two years later. I didn't mean to talk to Andrena in such an anonymous place, but where could I go? This was new research in a new city. Sometimes you can find a cozy enough corner even in a big hospital, but I didn't know my way around. And Andrena's very ill daughter was lying in a room three floors up, so Andrena was not about to go far. I had met her only once, a week earlier in her daughter's room on the east wing. I was introduced by the friendly speech therapist who thought Andrena might be willing to participate in the study my colleagues and I were doing. When I saw Andrena that first time, she was sitting on a chair, holding the hand of her daughter, a little girl of four and a half whose shaved head was barely visible above the white sheets of the bed. The small half room was jammed with people. People standing, sharing chairs, leaning against the radiator or a wall. The child's father, a grandmother, an older sister, an uncle, a cousin. Before we entered, the speech therapist told me that the parents were separated and Andrena was the one to ask. After some quick introductions, I directed my attention to her. To my surprise (her daughter looked so frail and her mother held her hand so tightly), Andrena smiled and agreed immediately to participate. "Sure, sign me up," she said. "I'd be glad to help." I left a few minutes later with the plan for our first interview. So there we sat, Andrena and I, in the twilight of that lobby, diagonally faced in our plastic chairs, my tape recorder perched between us. There is one thing I have noticed about interviewing people in the crisis of life. Many of them don't need much in the way of pleasantries. Time has changed its speed; it has become concentrated, portentous. It may be too fast or too slow, but it is never luxurious. Better, then, to get straight to the point. Andrena was one of those, I could see, who wasn't in the mood for leisurely opening remarks. "So," I said, "can you tell me the story of your daughter's illness up until now? Just begin at the beginning, wherever that might be for you?" And then she started to talk. Her nightmare offers a central image for this book. Andrena's nightmare seeped through the whole of her life, and, as she gradually discovered, there was nothing to do but learn how to navigate in it, even learn to make it a new kind of home, a home where she struggled to hope. Hope offered another sort of dream, an intimation of possibility for a better life even in these grim circumstances. This book is a meditation on hope grounded in a thirteen-year ethnographic study of African American families-parents like Barbara-caring for children who have severe and chronic health problems or disabilities, as well as the clinicians who serve those children. Hope, that "waking dream" as Aristotle called it, concerns imagined futures (Miyazaki 2004; Crapanzano 2004). Its direction is toward what may come to pass. It cannot be predicted-it is a future of "what if." Paradoxically, hope is on intimate terms with despair. It asks for more than life promises. It is poised for disappointment. Here is how the French sociologist Henri Desroche concludes his consideration of hope. Citing Roger Bastide, he offers this definition: "just a simple pause on a long path that stretches towards who knows what horizon, that retreats with every step we make toward it, towards its promise of light and clarity" (1979:171). With even darker irony, Desroche continues: "Hope as it is drawn by Kafka: 'The Messiah will come only when he is no longer needed. He will only come one day after his advent. He will not come on the day of the last judgment, but on the day after'" (1979:177). Hope as an existential problem takes cultural and structural root as it is shaped by the poverty, racism, and bodily suffering endemic to so many of the families I write about here. For the people in this study, especially the parents, hope emerges as a paradoxical temporal practice and a strenuous moral project. Biomedicine offers no cure. For many children, the prognosis is bleak. Thus cultivating a hopeful stance is paradoxical; it involves an ongoing conversation with embittered despair. To hope is to be reminded of what is not and what might never be. Family members speak of the call to hope as a moral call, bound up in views of what it means to live a good life, to be a good person. Many have spoken repeatedly about the need to hope, and especially about working to have the "strength" to hope, even when times are hard. I have heard countless conversations where family members and friends encourage one another to keep up their hope. Why is hope so important? Why is it required? What kind of vision of reality does it offer? I could quickly see that it was not the same picture clinicians often cautioned against; it has rarely seemed to me something as simple as delusion or denial. For these families, hope has represented a stance toward reality that requires careful cultivation. While clinicians and their voices appear throughout this book, my primary focus is on the parents (fathers at times, but especially mothers and grandmothers), who care for these children and work to negotiate health care with clinical institutions. The families I focus on are those I know the best personally, people whom I have seen in many contexts over the years and whom I have come to care so deeply about that my relationship with them has changed how I see the world. Andrena's news about her daughter's cancer brought with it not only fear but, as we shall see, an imperative to hope in the face of that fear, and in the face of an unknown future that stretched in front of her. I will consider dreaming that comes when you might least expect it, the terrifying nightmares that serious illness or tragedy can precipitate. Even more, I will consider what may be done with such nightmares, the work to make them habitable, to find within their terrifying terrain quieter moments, even small lush pleasures. Andrena and her daughter settled on the couch, watching Disney's Pocahontas for the twentieth time, illness temporarily at bay. A trip to the beach on a hot afternoon while her child splashes in the waves with her cousins, a four-year-old like any other. A quiet joke shared with the oncologist when the latest MRI looks better than expected. Her daughter waking unexpectedly from a coma as Andrena prays that God will give her more time to say goodbye. These dramas, large and small, constitute the narrative shape of hope, hope that is not merely cherished or passively received but actively cultivated, practiced. How is it that the families and clinicians I speak about here confront this paradox of hope? I am especially interested in the families on this matter, for they, more than the clinicians, struggle with it: How to cultivate a practice of hope that is bearable, despite its elusive promises, its retreating horizons, those darkest times when the suffering is so excruciating that any advent, any salvation, is already too late? How to find a way to hope that will be supported by clinicians and in clinical settings where expensive or even adequate care may be denied-both realities of contemporary health care for many Americans? When it comes to serious illness and disability, hope is a familiar topic. Many anthropological and sociological studies have emphasized the disruption and despair--the lack of hope or struggle for hope--that can accompany chronic and serious medical conditions. Scholars have explored the cultural shape of hope in a variety of contexts, examining the way patient, family, or clinician views of hope "articulate ... with a society's cultural interpretation of hope" (M. Good et al. 1990:60). Having to adopt an optimistic or hopeful attitude even when the prognosis is grim, as is sometimes culturally required, can put tremendous burdens on patients or family caregivers. Cultural contexts also shape patient-clinician communication about hope-often a fraught topic. Clinicians, too, struggle with how to maintain their own hope and how to convey and "regulate" the hope of their patients: How to give patients a "just right hope"? How to deal with a patient's "denial"? How to help patients find new things to hope for in their future even without the possibility of any medical cure? The rise of new biotechnologies has provoked new reconsiderations of social hope and clinical care. On the one hand, emergent technologies have helped to fuel health disparities between rich and poor on a global scale, a phenomenon described by some scholars in classically dystopic language. Technology emerges here as a kind of Frankensteinian monster (Lock 1997:238). But the development of innovative biotechnologies has also produced a much more optimistic discourse of hope among other scholars, a hope that has linked forms of democratic and political processes to science and technology itself (Haraway 1997; Rose 2007). My own starting point for a consideration of hope is grounded in the lives of particular persons and intimate moments of family and clinical life. I consider hope as located not primarily within biotechnical practices or dominant discourses that engender optimism or tragic pessimism (depending upon one's view) but rather, first and foremost, in highly situated practices of people struggling to live with chronic medical conditions. Hope most centrally involves the practice of creating, or trying to create, lives worth living even in the midst of suffering, even with no happy ending in sight. It also involves the struggle to forge new communities of care that span clinical and familial worlds. This is why I have chosen to speak of hope as a practice, rather than simply an emotion or a cultural attitude. I will consider the practice of hope not only as a personal struggle of parents like Andrena but also as a critical aspect of the health care encounter. Poverty and race figure largely into it. I explore how a group of African American families, many of them poor, traverse clinical spaces when their children have serious, chronic, and sometimes critical medical conditions. These navigations through the fog caused by all-consuming suffering are made more menacing by the uncertainties and dangers facing marginalized minorities who seek care in the health systems of the United States. I also consider these navigations from the perspective of clinicians who at times find themselves confused and uncertain about how to provide care or how to connect with families far removed from their own class and cultural background. Hoping is no mere personal affair when it comes to health care in a multicultural urban hospital. It is a border activity. Thus the central question for this book is: How is hope cultivated in a border zone? 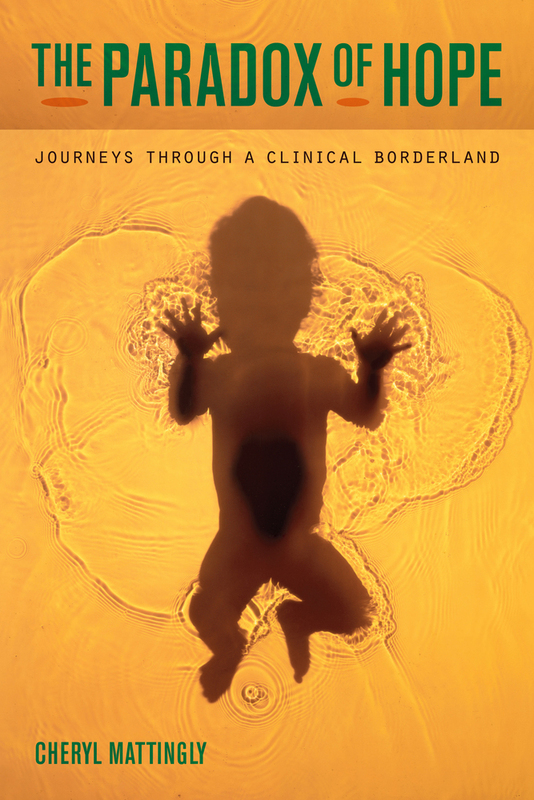 How does this border practice shape hope for parents, children, and clinicians? It has become quite popular to talk about life on the borders. Borderlands are perhaps the central figure of the contemporary social imaginary. Across a whole range of disciplines, the recognition that social worlds are porous, that boundaries are fluid and contested, and that objects and people are bound together or travel in all manner of unexpected ways continues to inspire our imagination and provoke our attention. In some cases, this has meant a literal focus upon a particular geographic spot, cartographically defined, where one can pay special attention to sites of heightened commerce among actors who are culturally diverse-large, multicultural urban areas, for instance, or the spaces around national boundary lines, zones of war, refugee camps, travels of the displaced across tenuous political boundaries, and the like. But borderlands need not be so visible on any map. They may also designate spaces defined by practices that bind people together who otherwise wouldn't belong together. It is in this practice-based sense that I am using the term borderland. It designates that flexible space in which healing is carried out, not only by health professionals, but also by patients and families. The narrative acts I will speak about help to shape this borderland and reveal the fluidity of this space and its connections to geographical and institutional sites that are far removed from any clinic: homes, churches, even Chuck E. Cheese and Disneyland. In this book, I focus on the task of creating borderland communities and how deeply the practice of hope is bound up with this struggle. I approach this problem through a particular theoretical lens that I call narrative phenomenology. Briefly, I have three overall aims. One is an analysis of hope as a clinical border practice, based upon this long-term ethnographic study that has focused upon the multiple perceptions surrounding illness, disability, and healing held by family members, clinicians, and the children they care for. A second objective is to offer a narrative phenomenology of practice that not only recognizes the macro structural dimensions of our social existence (the way discursive regimes are embodied and played out in everyday social practice) but also foregrounds the personal, intimate, singular, and eventful qualities of social life. A third, related ambition is to demonstrate an ethnographic methodology-narrative phenomenology as a kind of research method-that is deeply intertwined with the narrative framework I present. This is a mixed-genre work, a philosophical anthropology that has its abstract theoretical moments but is also filled with stories. It is primarily through the stories that philosophical-perhaps I should call them existential-questions are raised, questions about the human condition and the place of suffering and hope in it. I will focus upon small moments of everyday life, paying close attention to a gesture, a phrase, an argument, a joke-the pervasive, largely invisible stuff of ordinary social interaction. And in doing so, I will try to paint portraits that are reflective of the personal and social histories in which people live. In that sense, this is a book about the intersection of race, chronic illness, and clinical care in the United States. Yet I do not intend this work as some kind of definitive race story, or a book that speaks only or uniquely about the experiences of African Americans. While the cases I present are sometimes marked by features that make them singular to the African American experience and to the construction of race or disability within clinical encounters, my intention is to open an existential window onto the relationship between suffering and hope, exploring hope as a practice at once personal and communal. I mean to offer "concrete universals": that is, particular people and events that paradoxically, in their very concreteness, imaginatively reveal something about the struggles of many people, including ourselves. I opened my book in a lobby, a space I find especially fitting because I am going to tell travel stories, stories about struggling to create homes where no one lives, to make families (or at least travel companions) out of strangers. I will be writing about "dwelling-in-travel" (Clifford 1997:2), a space of "friction"-of "contingent encounters" and "interconnection across difference" (Tsing 2005:4). When James Clifford meditates on travel as a "'chronotope' of culture" (1997:25), he gives us an image: the hotel. Hotel "as station, airport terminal, hospital: a place you pass through, where the encounters are fleeting, arbitrary" (1997:17). However Victorian the overtones (conjuring up, as Clifford remarks, gentlemen travelers from an earlier era), it is a useful image. I have it a bit in mind when I consider the lobby. Not a bourgeois chandelier sort of lobby but just the kind you find in bus stations, airports, and, of course, hospitals. If urban hospitals quintessentially exemplify culture as a border zone (as I shall argue presently), then their lobbies offer a front-seat view of culture as a boundary space, a place intended to be temporary. Leaving there, after all, is the primary point. When you are in a lobby, chances are you are waiting. And not comfortably either, in the lobby I have in mind. Poor and even middle-class families who have very sick children spend quite a lot of time in such lobbies. There is a great deal of waiting to be done when caring for the sick, or in being sick yourself. Lobbies are supremely liminal spaces. You aren't even visiting yet. You are only waiting for a visit. Lobbies, even when well guarded, don't exactly belong to anyone (a notable no-man's-land). In a hospital, they are familiar frontiers. Everyone passes through them from time to time, unlike its many secret spaces where only a few are allowed to enter. Frontiers, by and large, precipitate "encounters between strangers of whom none come to the meeting with the permission to set the agenda in their pockets" (Z. Bauman 1999: xlix). I would not go so far as to claim that all of cultural life can be summed up by this trope. "Motility" and "non-rootedness" may not exactly be the "'primary reality' of culture," as some suggest (Z. Bauman 1999: xlv). But they very pointedly mark the cultural scene I investigate here. In exploring hope as a border practice, I rely upon a conceptual reframing of culture that has special salience for my purposes, one that has emerged over the past few decades as part of the refiguration of culture, a shift from anthropology's traditional task of elucidating "the crystalline patterns of a whole culture" to a focus on "the blurred zones in between" (Rosaldo 1989:209). The lobby provides such an apt trope because culture has come to be imagined as a site of travel. It is the name of a land one passes through as much as lives in, characterized more by hybridity and liminality than by any uncomplicated citizenship. As a scene of travel, it is attended by experiences of estrangement and displacement. Out of this has come a new kind of social common sense, one that abandons "old ideas of territorially fixed communities and stable, localized cultures" in favor of "apprehend[ing] an interconnected world in which people, objects, and ideas are rapidly shifting and refuse to stay in place" (Gupta and Ferguson 1997a:4). In this resituating, culture emerges more vividly as a space of encounter than of enclosure. Or, put somewhat differently, enclosure itself is increasingly treated as one element of encountering and-very often-conquering spatial practices. But borderlands are not totalizing; rather, they are "spaces of contradiction and disorder, as well as sites of cultural fluidity, identity making, and diverse and marginal forms of citizenship" (B. Good et al. 2008:22). Border crossing is a necessary, if treacherous, business in such fluid spaces. The lobby, with its in-between, transient character, is metaphorically apt in a second sense. The travel stories I tell concern encounters that have their temporal place within ever larger narrative horizons: they are historical moments. They belong as episodes not only within personal, familial, and institutional lives but within national and global ones as well. These travel stories are moments within a colonizing history that spans (even conservatively) three continents and three hundred years. Two historical horizons have particular salience to my topic. One is the rise of modern Western medicine itself, a story that has been told and retold and made especially famous as a dystopic narrative in Foucault's work. A second history, covering a roughly similar time period, concerns the colonization of the Americas and the importation of African slaves to work on newly founded plantations. The construction of the black body is, of course, an integral part of America's cultural history. Race, and quite specifically racial designations that divide black from nonblack, are "written into daily lives and experience in America" (Goldberg 1997:10), essential to the making of the modern American subject. As we know, these histories have intersected in an especially pernicious way for African Americans. Out of the development of a slave society in North America emerged an accompanying "scientific" medical perspective that became a tool for defining the black body as, essentially, biologically Other compared to the white one. Medicine and the emerging biological sciences helped to imaginatively construct the black body as particularly frail and needy. This vaster historical race story is vividly present in my metaphorical lobby because so many hospital encounters I describe are encounters across racial divides where participants see themselves or find themselves designated as both culturally and racially Other. The history of slavery, race, poverty, and illness lives as a menacing shadow for the families I write about. While I will describe many clinical encounters that reveal its centrality, the history itself will appear only as a shadow. Not all stories can be told at once or with equal clarity. Thus this vaster history is only intimated, gestured to, as I cast my eye on more intimate and immediate scenes. But though it is not explicitly detailed, it is palpably present. It can, for example, be heard in the voices of parents who still cannot shed this legacy of racism or escape the play of race in clinical care. This practical problem that families and clinicians face speaks to another key feature of culture reconceptualized: the interpolation of cultural difference and culture making as mutually constitutive events. "Culture," Lila Abu-Lughod writes, "is the essential tool for making other" (1991:143). The production of cultural difference becomes acutely visible in border zones, creating charged and antagonistic spaces. They are where cultural politics play themselves out, in a particularly heightened way, where the cultural is represented as difference. Culture emerges as a "contested category and ... site of ideological and political struggle" (Mahon 2000:469-70). As many have argued, cultural identity is produced only in the moment of cultural differentiation. Postcolonial, feminist, and race theorists have led the way in much of this theorizing of the borderland. Cultures, Homi Bhabha declares, "recognize themselves through their projections of 'otherness'" (1994:12). The creation of difference is a largely negative capacity, a pernicious cultural virus that turns others into Others. The urban hospital, as I have already suggested, is a quintessential cultural border zone. Because of its cosmopolitan nature, the practice of hope in clinical contexts is very much connected to the problem of understanding one's fellow actors, one's interlocutors. It is not difficult to see that such a border space will be rife with misunderstanding. In border zones, actors find themselves uncertain about what others are up to and struggle to be understood by their interlocutors. While much of life may be fraught with ongoing misunderstandings, interpretive trouble is particularly pernicious in clinical spaces where a great deal is at stake. Grounded in intimate moments of family life in and out of hospitals, this book explores the hope that inspires us to try to create lives worth living, even when no cure is in sight. The Paradox of Hope focuses on a group of African American families in a multicultural urban environment, many of them poor and all of them with children who have been diagnosed with serious chronic medical conditions. Cheryl Mattingly proposes a narrative phenomenology of practice as she explores case stories in this highly readable study. Depicting the multicultural urban hospital as a border zone where race, class, and chronic disease intersect, this theoretically innovative study illuminates communities of care that span both clinic and family and shows how hope is created as an everyday reality amid trying circumstances. Cheryl Mattingly is Professor in the Department of Anthropology and the Division of Occupational Science at the University of Southern California. She is the award-winning author of Healing Dramas and Clinical Plots: The Narrative Structure of Experience and coeditor, with Linda Garro, of Narrative and Cultural Construction of Illness and Healing (UC Press), among other books.